A very long time ago I wrote a sketch of my own character. It is in fact so ancient that it is well hidden on a long lost page of my blog that I put together when I very first founded this odd muddle of words that you, happy Reader, have the confidence to decipher. Now I seem to have produced another. Allow me to present this little piece as I work on some larger posts; one a happy thing on some interesting pamphlet typography, another on an excellent war artist, and at some point shortly shall come the final epitaph and frame for my long sojourn on the Gates of London. Nonsense gushing like a spring. Some more besides he sure forgot. He boasted his ‘thrice publushed’ name. In sciences he found employ. His life in lines of twenty four. Here it is, then – the last of these happy few posts on the Gates of London. This little history finishes here with the stories of three minor gates, one of which stands to this day; these are the Holbein Gate, Westminster Gate, St. John’s Gate, and Bridgegate. It is not easy to define a ‘minor’ gate in the city; I have my own small selection to present here, and may not be what the reader expects – though I hope my minor presentation will be a happy encounter. There were easily a dozen small gates and entrances knocked through London’s walls over the years as the growth of the city progressed, and the walls proved less defensive and instead just an inconvenient remnant of older times. It is indeed one of these small postern gates that Moorgate developed from. These gates, however, are poorly recorded and were generally little more than minor doorways made through the ancient fabric – in the end uninteresting both as a drawing as well as the subject of a singular history. There were plenty of other gates; some defensive and some decorative: of these I present a selection; the first is a monastic gate, of which there were once many such gatehouses in London; two are from the entrances of a palace, a grand way to show off power and wealth; and my final example is defensive, though it does not fall into the group of ‘major’ gates to the city. Allow me to gather a history of these, and present it immediately. This very fine gate is the only gateway of medieval origin still standing in the city – the Reader may take note that the fine gate of St Bartholomew-the-Great is not presented here instead since that gate was constructed from the remains of the church there following the dissolution, and was never in medieval times (as far as my minor knowledge affirms) a gatehouse. That of St John’s, however, was probably one of the finest medieval monastic gatehouses in London – being the entry point to Clerkenwell Priory, headquarters of the Knights Hospitalier. The first form of this gate was destroyed when much of the priory was ransacked during the Peasants Revolt and not rebuilt for over a hundred years. I can only suppose the cause for this delay being that there was enough of the ruined gate left to act as a reasonable gatehouse, and the priory’s fortunes being spent on entertaining royal guests meaning that none remained for the upkeep or reconstruction of its buildings. Whatever the cause of the delay, the new gate was built in 1504 by Grand Prior Sir Thomas Docwra, and it is the form of that gate which is still present today. At the time of the dissolution it was granted to the Duke of Northumberland, who used the priory as little more than storerooms. It was occasionally used by the city to entertain officials until 1537 when, in a rather dramatic attempt to reuse the priory for building materials, the majority of the church was blown up. When that infamous queen Mary came to the throne she rebuilt what she could of the church and attempted to revive the priory. Then,following her fall, it returned to numerous private hands, with occasional work on the church, but little known of the gate. The 18th century saw the gate become an alehouse, and by this time the roofline seems to have been rebuilt, as well as the top of the left hand tower. During the Victorian fervor for everything Gothic the gate was heavily remodelled and rebuilt in a style the Victorians found pleasing, but which masked or destroyed much of the true medieval fabric. It is this form that we encounter today – presently the museum, bur previously the headquarters, of the order of St. John. And indeed, if you want to meet with one of these kind relics which this work has humbly tried to revive, then this is surely the place. This very well designed structure gained the name Holbein Gate from common belief that it had been designed by the master artist himself, although there is no proof of this in any documents from the time. It was also known at different times as the King’s Gate or the Cockpit Gate. It served as the main gate to Whitehall Palace, taking roughly a year to build and being finished in 1532. Within only some small time after this it was apparently modified, with the gate arch being shortened to a square and windows being let in to increase the already ample living floors above. Unlike the defensive gates of the city, I can give no grand history for this building; of the two floors above it the lower would seem to have been rented out to different noble tenants and the upper set aside as official use. Indeed, the top floor was for many years the ‘Paper Office’. This gate along with Westminster Gate and the still remaining Banqueting Hall were the only major parts of the palace to survive the Whitehall fire of 1698. With the open space that the destruction of the palace created, the area became a busy thoroughfare and by the early 18th century the gate was already proving problematic to traffic. Suggestion was made in 1719 to pull it down, but there was an outcry against the monumental building’s destruction, and the plan was foiled. 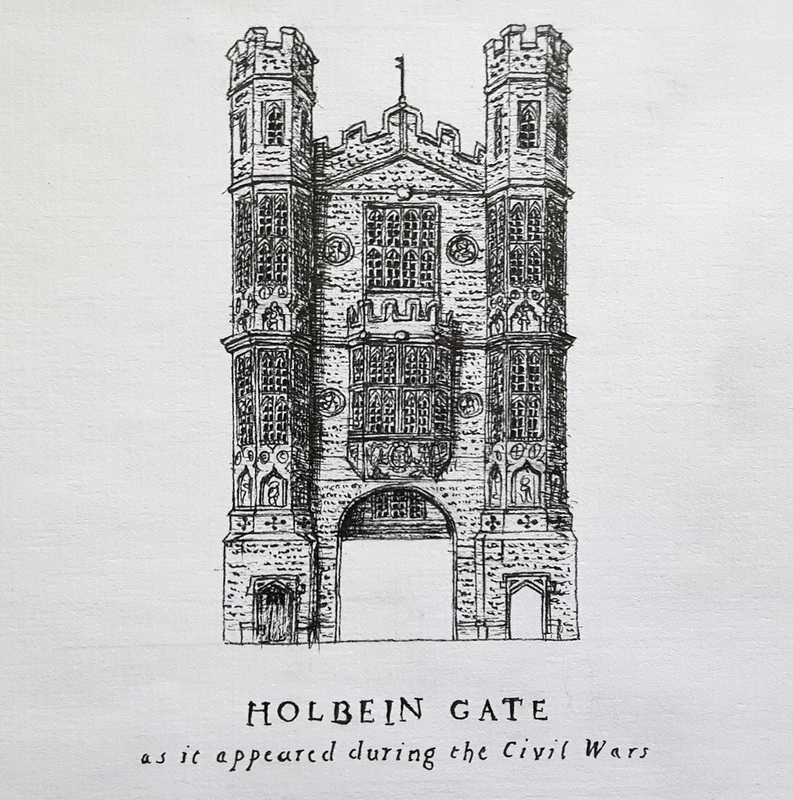 The Holbein Gate stood for 40 more years, and was taken down in August 1759. It had been intended to be re-erected elsewhere, but – and to the constant misery of the present times – that did not occur. 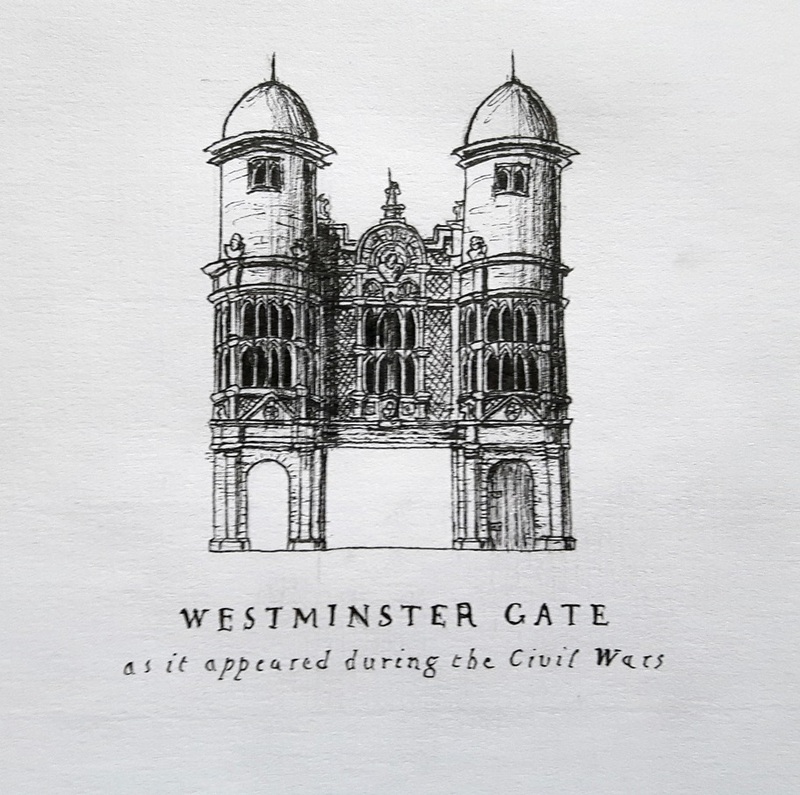 Westminster Gate is, similar to the above, of Tudor construction and was also a gate to Whitehall Palace, it was perhaps not as beautifully built as the Holbein Gate, but certainly more curiously. It acted as a minor gate to the palace and appears from masons’ fees to have been built in the early 1530s, at about the same time as the Holbein Gate. The structure seems to have remained relatively untouched after Tudor times, being used as lodgings – The Duke of Buckingham, that noble rogue, would have been familiar with it since his mother lived the latter part of her life there. An anonymous compiler of the celebrated work Old and New London adds an unusually unwelcome comment in the summary of the gate, noting ‘Altogether, if we may judge from the prints of the gate published by Kip, and also in the “Vetusta Monumenta” by the Society of Antiquaries, it was one of the ugliest structures in the metropolis’. Westminster Gate did not get the same reprieve from the plans of demolition that the Holbein Gate was saved from in 1719. After some planning the workmen moved in and the site was cleared in 1723, since at that time it blocked the only road into the houses of parliament. This gate, as far as history preserves, is of medieval foundation – though a bridge has been present in London since Roman times, and it is not inconceivable that those men of famous engineering skill put up a gate on or at one end of the bridge that stood then. The fact that the Roman bridge at times supported a small garrison suggests at least some kind of fortification existed upon it. The medieval tale of this gate begins with, of course, the building of a medieval bridge. It is partly down to the sad murder of Thomas Becket, Henry II’s unlucky archbishop, that the bridge was constructed – part of the great wealth of building that was done as penance by that noble king. At the centre of the bridge he placed a chapel dedicated to Becket, and – importantly for this work – upon the bridge he constructed at least one gate: the Bridgegate. The gate was likely finished midway through the reign of King John, of Robin Hood fame, in the first decade of the 1200s. Less than a further decade later it faced its first role as a defensive structure during the Barons revolt of 1215 – by an unclear scheme the Barons made it past the gate and into London. By the fifteenth century there were two gates on the bridge, one at each end. For this work I will focus on the southern most for the following reasons; firstly, it is apparently the oldest; secondly, it is the gate that was external to the city, and therefore more important in the history of the city’s defence; thirdly that more images of it throughout its time survive; and fourthly, it is simply the most interesting. 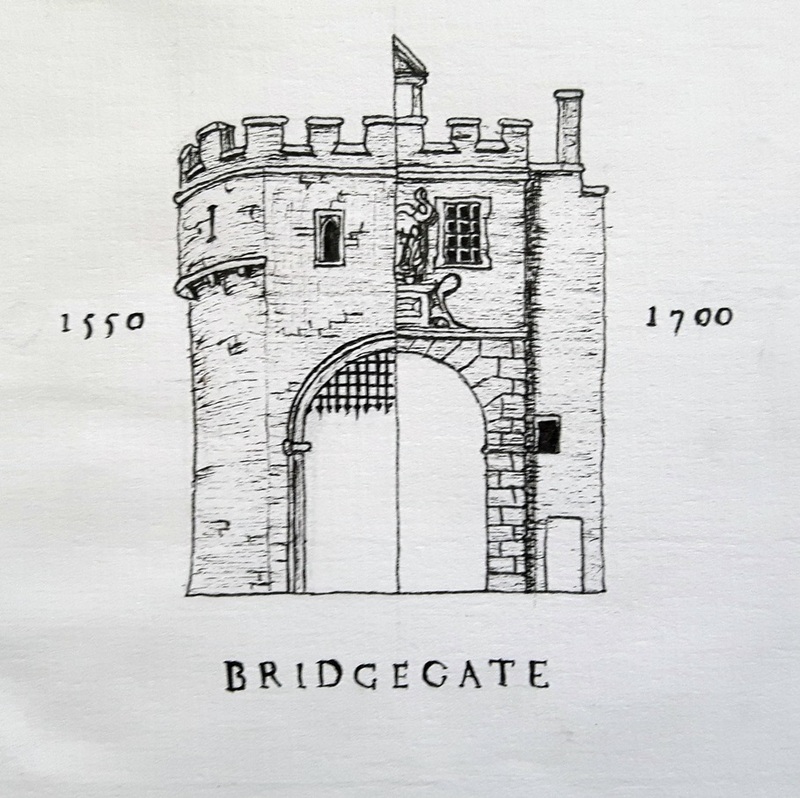 This last point, aside from the tales of daring attacks on it, is due in part to a particularly grizzly decoration that adorned the gate – all gates in the city were hung with traitors heads, but Bridgegate appears to have totalled the most, with sometimes more than thirty heads atop it. The heads being pickled and covered in tar meant that some could be many decades old before falling or being taken down. This gate is also celebrated as the bridge over which that ferocious Henry V entered following his triumph at Agincourt. It was breached by attackers at least twice more after the Barons’ Revolt of 1215; once during the Peasants’ Revolt, on the 13th June 1381, and once during Jack Cade’s rebellion of 1450. The poor gate was also burned in early May 1471, when the Wars of the Roses saw London briefly under siege. In April 1577 the northern gate was rebuilt, which saw the already bedecked southern gate gain yet another grizzly troupe of traitors’ heads. A little after this, on the northern side of the gate, a third gate of decorative wood was built. By this time, however, the buildings along the bridge were a considerable problem for traffic – it was in fact quicker to ferry goods across the river most of the time during the day. The last thing of note I find is the noble Charles II passing under the gate in great ceremony in 1660 having been restored to the throne. In 1758 the government began purchasing and demolishing the houses along London Bridge and not log after this the act approving the removal of the gates to the city was passed in 1760. The gate itself was completely cleared within two years, one of the last buildings on the bridge to be taken down. Shortly before this it appears a great deal of work had gone into having the gate refaced in an austere but reasonably pleasing fashion, likely after 1730 since Seymour makes no mention of this construction. Adieu, dearest of Dear Readers! The last of the main gates is here! 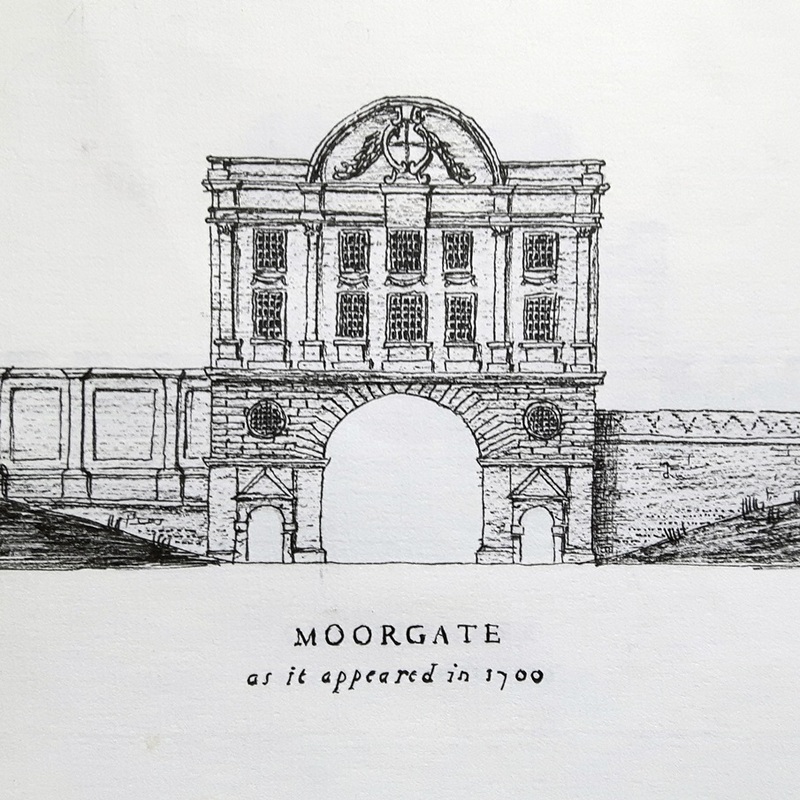 Here’s a quick history of Moorgate and a summary of the final days of the gates; enjoy, kind Reader! 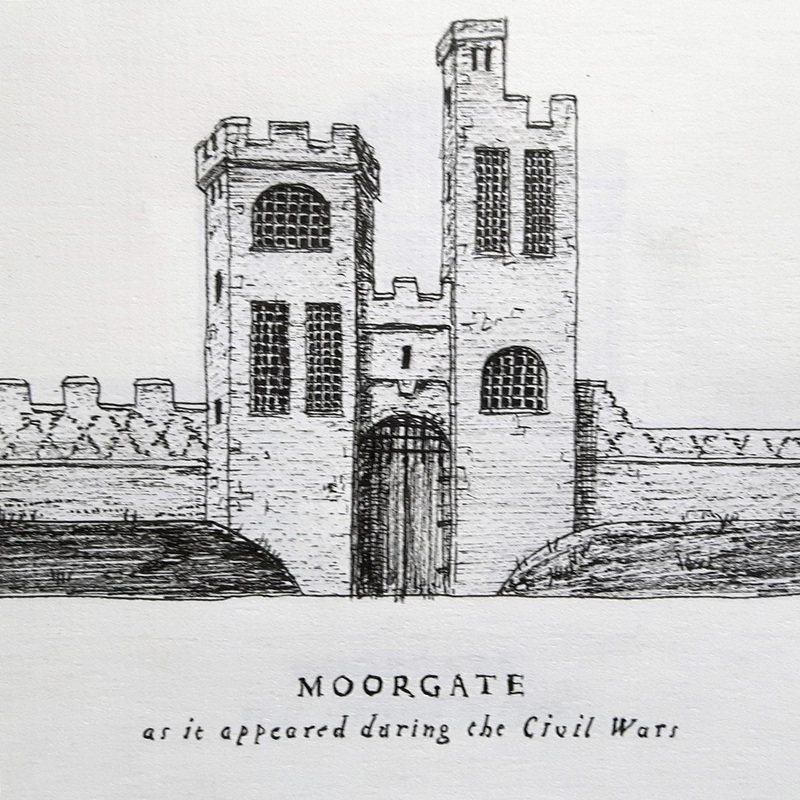 Moorgate is the latest of the main city gates to have been constructed, and according to folklore was originally a Roman postern gate. Whatever the date of the original postern, the small nature of the gate compared to the heavy traffic that it received meant that orders were given in 1415 for the wall in that place to be taken down and a new grand gate constructed in its place. This was to allow better access for Londoners wanting to get to Moorfields, one of the few public areas in the city that was not build upon. Other reports suggest that the postern was in fact sealed up and Moorgate was built in a different position to its predecessor. William Hampton modernised the gate, giving it a more impressive look, in about 1511. This date is questionable however, since Hampton was mayor of London in 1472 and died ten years later, making it unlikely that he was available to help improve the gate in 1511. It is possible that there is confusion here, and Hampton improved the gate during his mayoralty and it was then again repaired in 1511 by another, and both dates appear in other histories – this would agree with several 18th century histories I read after having supposed this point. 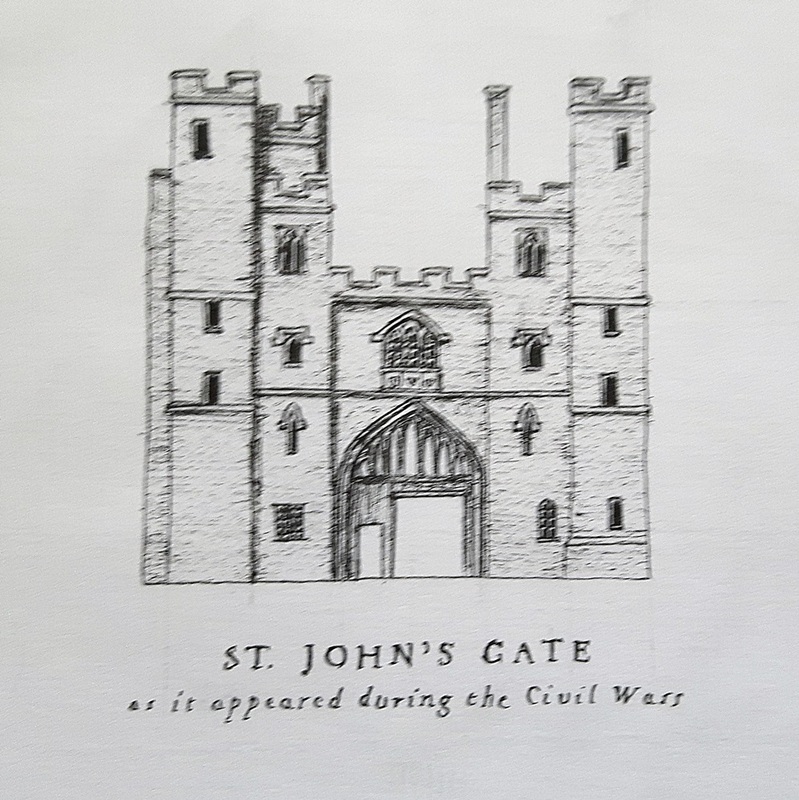 The gate was apparently damaged in the fire of 1666, although according to some sources the fire never actually made it to the gate, so the fire may have been more of an excuse to fund its further improvement, whatever the case it was rebuilt completely in about 1672. This new gate had pedestrian arches on each side and an extra high main gate, reportedly either to allow soldiers ceremoniously marching through it to hold their pikes straight, or due to the city’s want to introduce a haymarket nearby and therefore wanted space under the arch for tall carts of hay to pass. Finally the gate was pulled down in 1762, and the stone reused for widening the central arch of the old London Bridge. These excellent gates, the history of which is now related in as full and ready detail as I can muster, steadily descended from their original defensive purposes as early as the medieval period, when garrisons were replaced by prisoners and their military use began to diminish. They remained a symbol of power and were useful for displaying the dismembered parts of traitors as late as the end of the 17th century. By the 1600s several parts of the wall around London had been broken through, and peppered with a great number of small gates and entrances for the convenience of the people. The futility of the walls and gates for any kind of defence was further proven in the Civil War, when rather than using these defences to protect the city, new earthworks were built beyond the city limits – more practical since they were in the open, away from the crushing houses and streets, as well as being better suited against the artillery of the times. After the restoration of the glorious King Charles II in 1660 the physical wooden gates of the city were all removed from their hinges and the portcullises jammed open, several of the gates at this time were already ruinous and they were already well beyond any form of practical defensive use. By now being well within the limits of the city, one can only suppose that any use made of the gates for collecting charges for bringing goods into the city had long since passed. The last date that I can find for any considerable construction work on the gates is in 1735, when Bishopsgate was completely rebuilt in a dignified Georgian style. Finally, the gates became more and more of an inconvenience, blocking traffic and stopping the widening of roads. The London Streets Act 1759/1760 was passed to allow the main gates of the city to be demolished and within less than a decade not a single trace remained of them remained. One more post to come; the selected minor gates of the city.